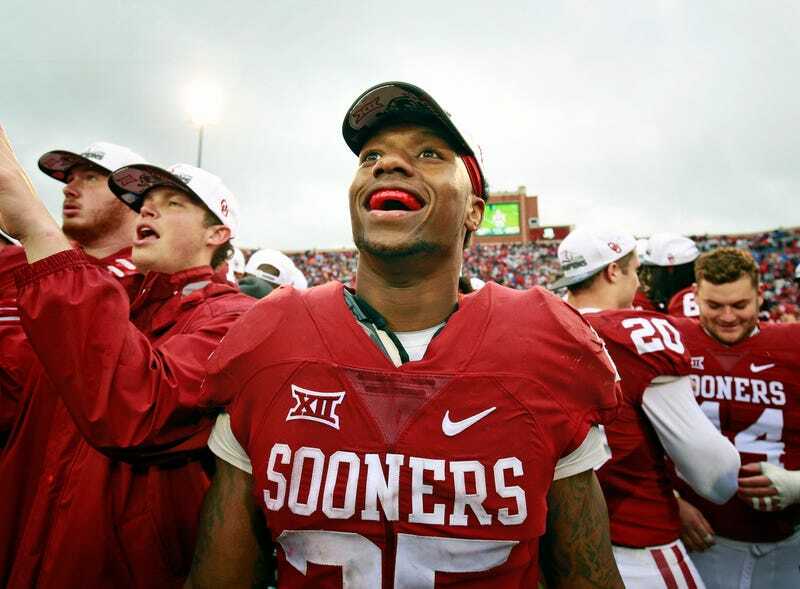 Running back Joe Mixon of the Oklahoma Sooners after the game against the Oklahoma State Cowboys on Dec. 3, 2016, at Gaylord Family-Oklahoma Memorial Stadium in Norman, Okla.
On Tuesday, video was released of University of Oklahoma running back Joe Mixon talking to police about the 2014 assault that was captured on video and appears to show Mixon punching a female student in the face. Mixon's explanation to police is the first statement released to the public that sheds light on moments leading up to the incident. "The gay dude … he called me something," Mixon told police in the video, Sports Illustrated reports. "He was like [expletive]. So then I was like, you got me messed up. And then I called him a [expletive]. And after that, the girl, she dropped her purse. That's when she came in my face, pushed me, and then my glasses came off, and then, like, I had, like, jumped at her, like, to watch out. And then she came in my face. I put my head down. And she swung on me." Mixon continued: "And after that, like, I was so shocked because she hit me so hard. It felt like a dude hit me. And after that, like, my face went boom; my reaction was just right there." Surveillance video of the incident shows Amelia Molitor and a male friend enter the café. Mixon follows shortly after. You can see Mixon exchange words with the two and turn to walk off when Molitor confronts him. She pushes him and Mixon jumps toward her and she appears to slap him. Mixon then punches Molitor in the face. There is no audio on the video. According to SI, Molitor suffered several broken facial bones. Mixon accepted an "Alford Plea to the misdemeanor charge of acts resulting in gross injury/outraging public decency." He was suspended for the 2014 season and played 11 games for the Oklahoma Sooners this year. The video has caused uproar and rekindled a familiar argument about coaching staffs' coddling of players. Many believe that Sooners head coach Bob Stoops protected his player when he should have been kicked off the team. The full video of Mixon's conversation with police can be seen at Sports Illustrated.